The first group pictures of Marvel’s Defenders are here, courtesy of Entertainment Weekly. 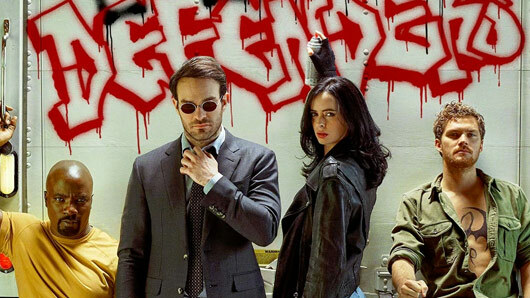 The superhero supergroup, which comprises Daredevil (Charlie Cox), Jessica Jones (Krysten Ritter), Luke Cage (Mike Colter) and Iron Fist (Finn Jones), will unite for a joint Netflix series about their exploits later this year. We’ve already met Daredevil, Jessica Jones and Luke Cage in their successful solo shows on Netflix, while the Iron Fist solo series is scheduled to arrive on March 17, 2017. The Defenders may all roam the streets of New York but, with the exception of former lovers Jessica Jones and Luke Cage, don’t actually know each other as of yet. This is all set to change with their first meeting in Marvel’s Defenders, where they will be caught by surprise when all pursuing the shady corporation Midland Circle. Showrunner Marco Ramirez said: “Every one of them is following their own trail of breadcrumbs, trying to unpack a mystery in New York. Marvel’s The Defenders will premiere on Netflix later this year. « Made In Chelsea original stars set to return to the cast?